Writing Memory: The Search for Home in Armenian Diaspora Literature as Cultural Practice. 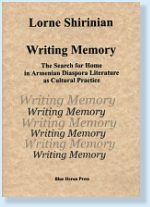 In Writing Memory, Lorne Shirinian has written an important introduction, which places Armenian American literature in the context of the Armenian diaspora and analyzes its significance for this transnational culture. The book contains six essays and an afterword, in which Shirinian speculates as to the future of Armenian diaspora culture.